Spheric Music presents Robert Schroeder “Backspace” – Chain D.L.K. pulsing sequencer and groovy rhythms BackSpace beams you up and brings you back to the tension and relaxation of the space music of the 80s. 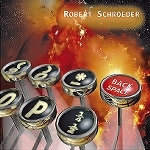 Robert released a wonderful spacey EM-disc in 2007 with his work SphereWare (Spheric Music SMCD 2016), but BackSpace could even be on top of SphereWare. The new album again will be a delight for all traditional EM fans. the rest of the silver disc with a duration of over 72 minutes. closing track “Wake Up” … this piece makes awake. Just enjoy!